Urban music enthusiasts listen up! The St. Jerome’s Laneway Festival is coming back to Singapore for its 5th installment in 2015! The upcoming line-up features a variety of acts including Singaporean, Malaysian as well as international artists. Touted as the strongest line-up to date, the event will be hosted once again at The Meadow at Gardens By The Bay. 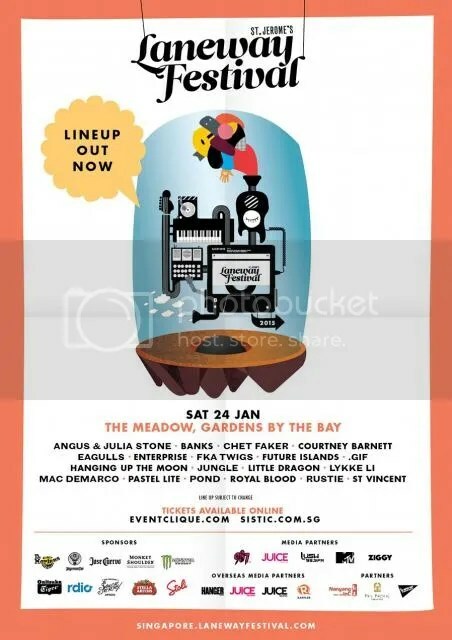 What sets Laneway apart from the many other music festivals out there is how it not only showcases an incredible line-up, but at the same time boasts a variety of activities around the festival grounds. So while you explore the spacious pastures of The Meadow, be sure to explore the food and drink kiosk as well as the many fun activities in store too!